Those who know me will know that I love hankies. I always have at least one in my pocket, one in my bag, and occasionally one in my bra strap when I don't have pockets. I keep one under my pillow, and when I change my bed sheets I find a whole cache of them where they've multiplied. They are not only useful (you can use them for a whole range of things - not just nose blowing), but they can also be really cute. Here's a few of my favourite hankies that I own. I can't remember ever not having this one, so it must be nearly as old as me. I'd put it at around 1991. The bear family out for an outing. It's so raggedy it's not usable, but I just can't get rid of it! It's precious! This lovely rabbit has a scroll above his head that reads "Thinking of you". I wonder who was thinking of me. This one I probably got at around age 9. I'd put this at around 1992. Whales! Same vintage as above. All sorts of things on this cute hanky! I love how retro this one looks with its bold colours. I also have this one in a pale green and a blue. This is a hanky from Japan. They sell a LOT of them in Japan, but I've never seen anyone blow their nose in Japan. They use them to dry their hands in public bathrooms apparently. But it works for noses too. Cute bunnies! All my hankies together, plus some I didn't show you. So where can you get a cute hanky to show off that you mean business? 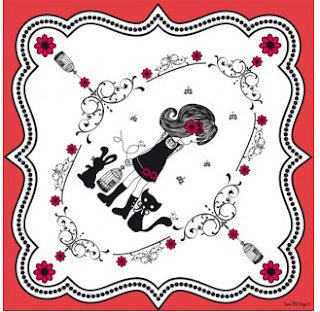 I've found an Australian shop that sells gorgeous printed hankies online (as well as a whole lot of other cute accessories). This one is called the "Cute things" print - can you see why? I hope this has inspired you to get out your Nana's hankies and save the environment one tissue at a time! Haha well I certainly wouldn't use someone else's! When I've got a bad snotty cold I use tissues for hygiene but when you've got a drip from the weather nothing beats a cute hanky!